I use this when I have severe skin irritation. It’s quite expensive, as people say, so I use this only when I feel skin irritation coming. Or at least that's how I feel. It works gently and gradually. I don’t feel secure unless I keep a bottle in the house. I bought this in a specialized store I often go to. I was trying to decide between this and Benefique’s Multi Conditioner, but I was told that the Skin Conditioner is more refreshing, so I bought the 165ml size. I have inner dry & oily skin. I have a rather disappointing chronic acne problem with enlarged pores. It comes from my parents’ genes... :( The product felt fresh, and it was very nice. I was wondering whether to get the biggest size, but I wasn’t sure if it would suit my skin, so I bought the middle size... I applied a lot on the cotton pad and used it quite a bit, and it didn’t last for a month. I personally go through 2 bottles of lotion per month, so I don’t think it’s worth the price for me... Also, it makes my skin fresh and smooth, but it didn’t show good results on my acne that needed most work... I got breakouts just as usual. lol It’s not so cheap, so I don’t think I’ll buy this again. Since it feels a little dry too, so next time I’m thinking of using the Multi Conditioner. This is my first time using Skin Conditioner! I'm using it with Exage's emulsion, so honestly I'm not really sure which one is doing the work for me... But since I started using it, my skin's calmed down so much, and it's really moisturized and soft. There's just the recommended set. It has a kind of retro fragrance, like a really cosmetic-y fragrance, but I've used Meishoku's Biganui and Sekkisei (which have the same kind of fragrance) so it didn't really bother me. But maybe people who don't like fragrance would have a problem, I don't know. Anyway, the scent goes away pretty fast. They say really dry skin shouldn't use Skin Conditioner, but I have fairly dry skin and I wasn't bothered by it at all. 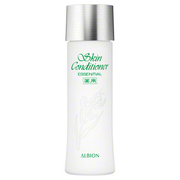 I have problems with acne and enlarged pores, so I feel like Skin Conditioner is working better for me than Exage. I thought I might get tired of it, so I bought a small bottle, but if it keeps going this well I'll buy it again, I think.